Here’s a troubleshooting hint for Huawei Y6II LCD Display problem such as a blank display or no display at all and otherwise a corrupted or garbled display. This solution may help you for easy repair procedures. Note: This only works if you can still hear something on the phone like tones, incoming alerts and not on a white screen problem or hang up on white screen situation. The quickstep to fixing display problem is that you have to verify a working LCD, just replace the LCD screen module at once just to ensure that the LCD is working or not and then proceed to hardware troubleshooting after confirming that the LCD is still fine. Just locate the highlighted components shows on figure solution picture below and do have a careful check up on each one of them one by one. Dry soldering of display connector pins. iHuawei Y6II LCD screen might be faulty. Touch screen has encountered any kind of water damage or moisture. Phone’s touch screen is damaged due to any physical collision. Touch Screen IC might be faulty. 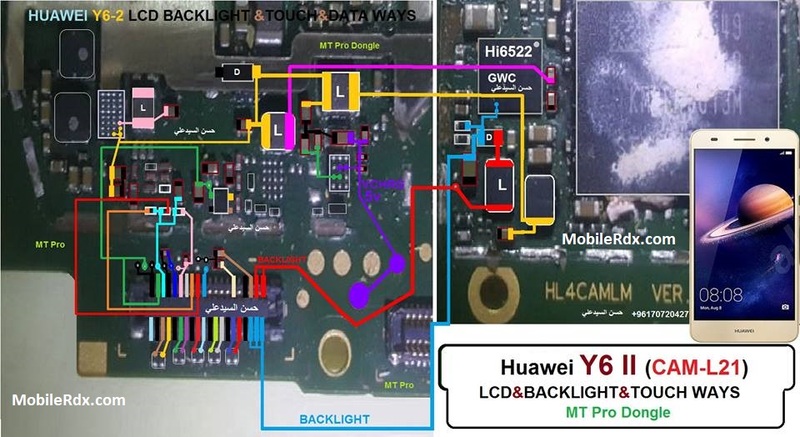 Loose connection of Huawei Y6II touch screen connector with board. Screen might be broken which also affected touch screen. Dry soldering of touch screen on-board connector. Connector strip might be damaged. after disassembling Huawei Y3II check motherboard if there is any carbon water damage or rust.clean whole board with electronics cleaner and then apply hot air for a few mints so that it can be dry. replace led if it is a jack LCD and if it is passed then after removing check its points value.if the value is ok then replace lid and if the value is missing then check whole parts components as given in above diagram.check all paths and if any tracks of them are missing apply jumpers. For more information and new tips and tricks about this problem solution keeps visiting this page we will update it if there will be new updates.some related post is also given below you can read more about the mobile phone.